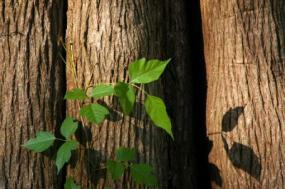 Poison ivy is a fact of life in the summertime, but knowing about poison ivy treatment can help. Without treatment, the itchy, blistering rash can ruin a camping trip or make for a miserable week at home. Cleaning off the oil within a few minutes of contact will help minimize the rash. Be sure to clean clothing and equipment, too. For a mild rash, simple home remedies can provide relief. Try applying a washcloth soaked with cool water. Ice, wrapped in a towel and applied to the rash for a few minutes at a time, can also help, but use it only if the rash doesn't have blisters. A cloth soaked in cool milk makes a soothing compress. It has to be whole milk, though, not skim, because it's the fat that helps. Milk of magnesia can be applied directly to the rash in a thin layer to help relieve the itch. Antihistamines like Benadryl can help with poison ivy treatment, although some doctors think that it's primarily helpful because it makes the patient drowsy. If you're asleep, you won't notice that you're itching. Pediatric website Dr.Greene.com suggests that parents give children antihistamines in the evening precisely because it makes them tired. Topical antihistamines (creams applied directly to the skin) aren't recommended. It's hard to tell how much medicine gets absorbed into the body, especially if the rash covers a large area. Plus, many people get a rash from antihistamine creams. Calamine lotion can help dry out an oozing rash and soothe the skin. Apply it to affected areas and allow it to dry. It will leave a pinkish coating on the skin. Lukewarm oatmeal baths provide relaxing comfort as well as relief for mild itching, but the oatmeal has to be specially prepared-the stuff you eat for breakfast won't do. Aveeno makes a colloidal oatmeal product specially designed for use in the tub. You may be able to find other brands and generic versions, too. Aveeno also makes oatmeal-based lotions that might help. Using topical corticosteroids is a very effective way to treat itchy rashes. Look for a medicine called hydrocortisone, sold over the counter. Brand names include Cortaid and Cortizone-10, or look for less expensive store brands. Be sure to follow the package directions, though, because corticosteroids can cause medical problems if they're used too often or in too large a dose. If the rash covers a large area of your body, check with your doctor before you use one of these products. The Sanford Poison Center identifies corticosteroids as the most recommended type of treatment for poison ivy. If the rash is really driving you crazy and at-home treatments don't help, it's time to call the doctor. Your physician can prescribe stronger steroid creams. He or she can also give you a steroid shot, which will usually zap the itch and help the rash get better faster. Don't be frustrated if your doctor refuses to write a prescription. Using steroid medicines comes with some risks and side effects, and steroid treatment may not be suitable for everyone.